Mirror Polished and patinated hand forged Javanese Gongs, Copper Patinated Steel, Bronze anodized architectural aluminum and stained wood robotic mallets, LED light pucks, with physical computing system. 2 Patinated Steel gongs with welded brass knobs, Powder coated steel, 2 wood, bicycle tire and fabric mallets with robotic mechanisms, physical computing system. Patinated mirror polished Bronze Javanese Gong, white powder coated steel, Black cord, countdown timer. White powder coated steel, copper anodized aluminum, bleached natural fiber and wood mallets. New York based conceptual artist Arron Taylor Kuffner studied and submerged himself into the art of traditional Indonesian gamelan musical instruments during his time living in Java and Bali. 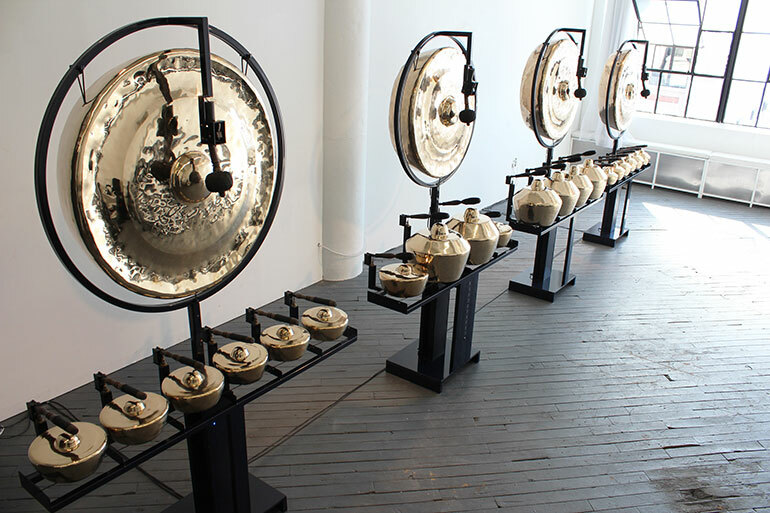 Kuffner preserves and reinterprets these ancient traditional instruments by retrofitting them with mechanical mallets that are connected to a self-built computer network that transcribes his compositions. His site-specific sonic, kinetic sculptures are hand fabricated using Indonesian forging techniques, and finished with traditional bronze, brass, iron instruments and robotic technology. Kuffner is a trained painter and metal sculptor, a former street artist, theatre director, international DJ and music producer. Kuffner lived and studied at the Institut Seni Inodenesia Yogyakarta, where he embraced the traditions of both the gamelan and village life. 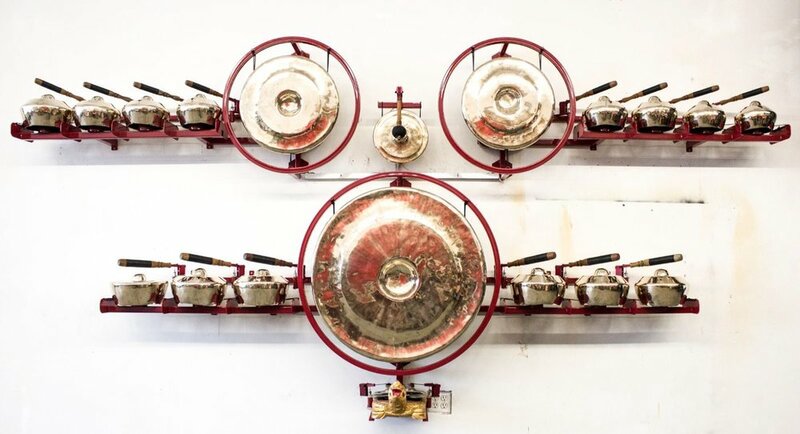 Dedicated to expanding the legacy and creative cultural power of gamelan through innovation, Kuffner’s viscerally powerful installations and site-specific performances have stood alone both as art works and mechanisms that tell us a story of globalization and modernization.